GREEN BAY — Two things quickly became clear as Lance Kendricks’ voice crackled over the speakerphone Tuesday afternoon: The Green Bay Packers’ newest tight end is a Wisconsin kid through-and-through, and he is having a hard time containing his excitement about being back home — and playing with Aaron Rodgers, his workout pal and arguably the NFL’s best quarterback. For Kendricks, joining the Packers after six seasons with the St. Louis/Los Angeles Rams was “a long time coming for me,” he said Tuesday. So long, in fact, that the first time he hit free agency, he was hoping the Packers would be interested. They weren’t at the time, but they were after the Rams cut him last week. And now, the prodigal son believes he is where he has long felt he belonged: From his days embracing his role model status as one of the Milwaukee King High School and the City Conference’s inspiring success stories, to having taken part in a Punt, Pass & Kick competition inside the Packers’ Hutson Center practice facility as a teenager; to cherishing his time at the University of Wisconsin, to boldly wearing his Milwaukee Brewers gear — and keeping his Brewers license plate — while living in the heart of St. Louis Cardinals country. “I’ve always dreamed of playing for the Packers. I never knew if it was possible,” Kendricks said. “When I was a free agent (in March 2015), I spoke to my agent and I said, ‘Hey, if the Packers did have an opening, that’s definitely a team that I would be interested in looking at.’ The way everything works, it doesn’t always pan out how you want. I ended up just staying with St. Louis, (but) I just feel like this all happened for a reason and I’m glad it panned out this way. 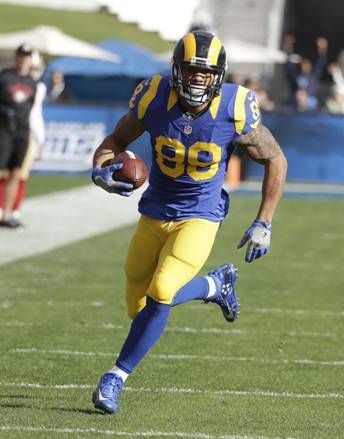 After Kendricks learned of his release from Rams general manager Les Snead on Thursday — “I thought I played pretty well last year,” Kendricks said of his career-best 50 receptions for 499 yards and two touchdowns — the Packers wasted no time pursuing him. He woke up Friday morning to his wife, Danielle, telling him that the Packers were calling. By Friday afternoon, he was on his way to Green Bay, and shortly after reaching a deal, he heard from Rodgers, with whom he’d been working out — along with Packers outside linebacker Clay Matthews, left tackle David Bakhtiari and tight end Beau Sandland — in a group of 25 or so NFL players at a gym just north of Los Angeles. “Obviously, he’s a great guy, great person. He was actually the first person that called me after he found out I signed,” Kendricks said of Rodgers. “He just told me that he’s looking forward to working with me and we’re going to have a fun season, exciting season, and just be ready. Kendricks did his best not to disparage the quarterbacks he’s had with the Rams, but his enthusiasm about playing with Rodgers — even if he’ll be sharing the tight end pass distribution with fellow new addition Martellus Bennett and holdover Richard Rodgers — was obvious.